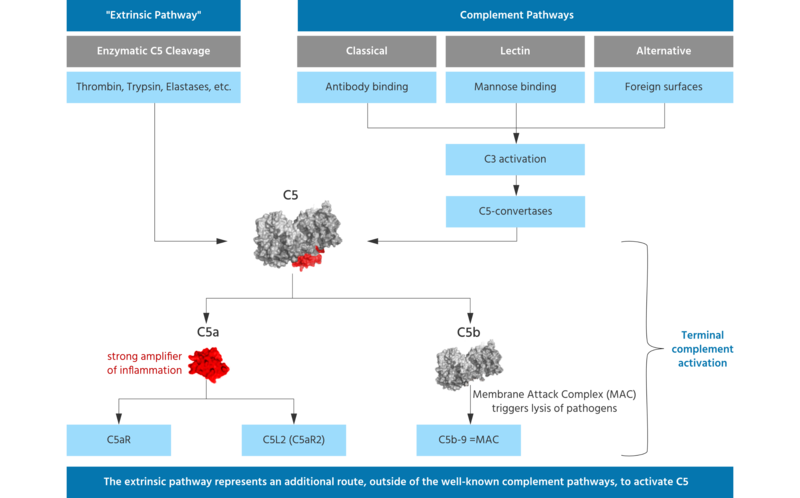 The complement system can be activated via three major pathways: The classical pathway, the lectin or mannose binding lectin (MBL) pathway and the alternative pathway. The classical pathway can be set in motion by antigen-antibody complexes that react with activated C1q. The lectin pathway is initiated by either serum MBL or ficolins that recognize certain sugars on microbial surfaces. The alternative pathway can be activated either by the presence of foreign surfaces such as lipopolysaccharides or through C3b generated by spontaneous hydrolyses, the so-called “tick-over”. All three pathways merge at the level of C3 which can be cleaved / activated by the classical or alternative C3 convertases (enzymes), resulting in C3a and C3b. C3b is a very important factor which directs our immune system to recognize foreign cells and particles which need to be processed by our T-cells and B-cells to generate antibodies against them and which need to be "sorted out" and eliminated from our system through various other cells. However, C3 cleavage also results in formation of the classical and alternative C5 convertases (enzymes), activating / cleaving C5 (please note: other enzymes can also activate C5). This event is referred to as terminal complement activation, resulting in the very potent "inflammatory booster" C5a and, on the other side, the terminal membrane attack complex (referred to as MAC or TCC or C5b-9 complex), which can permeabilize membranes of microorganisms, leading to their lysis. Thus, MAC formation is an important innate defense mechanism. Blocking MAC formation will lead to susceptibility to life threatening infections with encapsulated bacteria, such as meningococci, in humans. Noteworthy, terminal C5 activation does not require activation of the three complement pathways and related formation of the so-called C5-convertases. Other enzymes present, e.g. in the coagulation pathways or secreted by phagocytic cells such as macrophages, can also directly cleave / activate C5 such that C5a and C5b are formed. The C5 molecule has different binding and cleavage sites for enzymes to disengage C5a from the complex. Liver cells are known producers of C5 and contribute to blood C5 levels. However, various other epithelial cells have been found to also produce C5. It was shown that lung epithelial cells cultured in vitro can generate C5 upon stimulation and lung macrophages added to such cultures were able to cleave / activate C5 leading to generation of C5a in the absence of other complement factors in the cell culture. 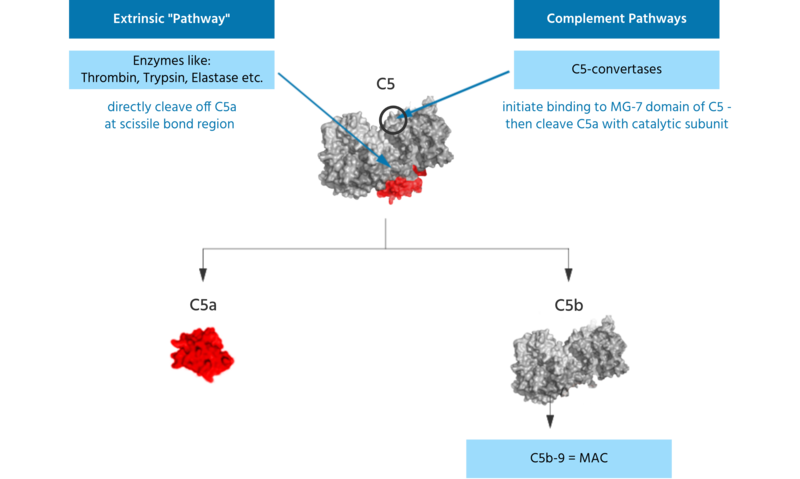 Thus, C5 can be activated and C5a can be generated independently from the complement pathways.